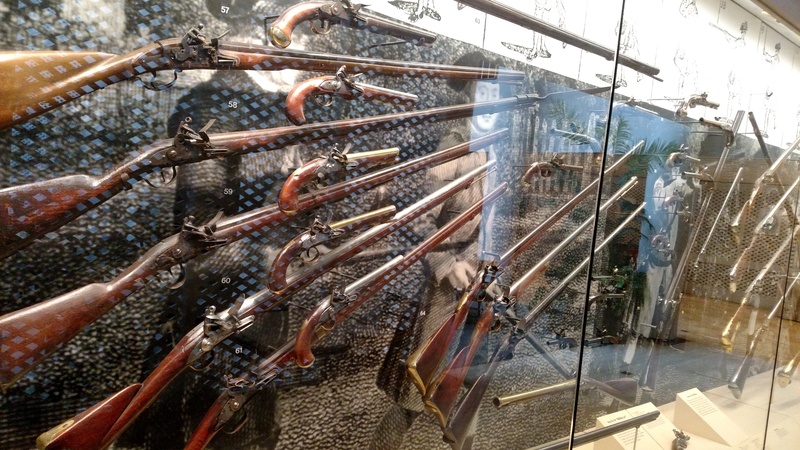 Yep, firearms of all kinds were very prevalent in Colonial America. As might be expected in a far distant land with thousands of miles of frontier bordering it. The following are a few interesting details that were found in the William and Mary Law Review Volume 43 No. 5,2002 Counting Guns in Early America by James Lindergren and Justin L, Heather. The information that is listed below comes from probate records from the various colonies where full inventories of personal belongings were made and kept. So the numbers are dependent on estates going through the probate process, which was not always the case. Interesting, but not conclusive. In inventories from 1774 firearms were found listed in the 53% of male estates. At the same time, female estates showed that approximately 38% of women-owned some sort of firearm. From the same inventories, only 30% of estates showed any cash in the inventory. 14% owned some sort of edged weapon. 25% had bibles listed, and 62% listed any book at all in their inventory. Approximately 10% of all inventoried firearms were listed as either broken or outdated. The information provided states at least one firearm is listed. It would not be a stretch that most people that had one, more than likely had more than one. For comparison in a recent ongoing study, as of 2015 approximately 41% of US households owned at least one gun. For the counterpoint. The article that this information came from was written to dispute the findings of Michael Bellesiles who in 2000 wrote Arming America: The Origins of the National Gun Culture. In that book, he contends that firearms in Colonial America were few and far between. Often with the colonial militias needing to confiscate guns to arm their ranks. A review of that book can be found here at The New York Times website. If you feel like digging into the question, you can get a copy of Bellesiles book here with its stellar 1.5-star review average. This may be a case of reading the book, and the article and see if you can help answer the question about how prevalent firearms were in Colonial America. The Stamp Act had an incredible effect on history, but it had an unusual side effect that sometimes gets missed in the discussion. To tell that though we need to first look the Stamp Act itself. In 1765 the American Colonies were firmly under the control of the British Parliament. The recently ended French & Indian War (Seven Years War in Europe) had left the British the undisputed ruler of the North American continent. The British Army in conjunction with the American colonial forces defeated the French and all seemed well for a time. Prior to the French & Indian War, the British rulers had a sort of hands-off policy towards the American colonies. Only occasionally tweaking or supporting but never really “ruling” as they could. Now the British were faced with two issues. The cost of the war to defend the colonies from the French and the now ongoing expense of posting substantial force in America to defend against the natives. They needed money and felt it was time for the colonies to foot their share of the bill. The first attempt at this was the 1765 Stamp Act passed by Parliament. The tax would require the colonists to pay on anything that required paper. This included legal documents, licenses, newspapers, other publications. Even playing cards. This did not sit well with the colonists who opposed this sort of “direct” taxation. They took to the streets in protest through most of the colonies. It could be said that the revolution started here. It was eventually repealed and Parliament would spend the next ten years stumbling through a bad idea after a bad idea to get the Americans to pay taxes. So the unusual side effect? People in the colonies who took offense with the Stamp Act looked for some way to show their displeasure and to speak out beyond the newspapers and protests. So a market developed to fill that need. Whereas today we would wear ribbons or buttons or put bumper stickers on our cars, items like you see in the photo above, a simple teapot with a slogan became one of the more popular forms of subtle protest. Surely these items were made in Boston or Philadelphia or any other of the hot spot of the revolution. Nope. They were made in England and Ireland and shipped to the Americans. While the British government struggled with how to deal with the Americans, their merchants figured the best way was to take their money and laugh all the way to the bank. On October 19, 1781, the Sige fo Yorktown finally came to an end. American and French forces accepted the full surrender of the British army. The war would go on for several more years, but the British defeat at Yorktown was the last full battle of the American Revolution. The actual surrender was completed on paper in fourteen articles of capitulation that were agreed upon by the commanders. The document above was believed to have been printed on a French ship in the bay and was one of several copies used to first spread the word of the surrender. It is original and dates to 1781. British and German soldiers and sailors in York and Gloucester were to surrender themselves as prisoners. Artillery, arms, stores and military chest (money) were to be turned over. Two redoubts on the left flank were to be handed over to the American/French forces. Officer may keep their sides arms and personal belongings. The soldiers while prisoners were to be afforded the same rations as American soldiers. They would be allowed to receive additional supplies as provided by their officers or other parties. Some of the men not counted above may be paroled to Europe for the remainder of the war. Officers will be allowed to maintain soldiers as servants. A ship was to be provided so that Cornwallis could communicate with his commander, General Clinton, in New York. Traders that were captured with the British Army were no to be treated as prisoners and were allowed to dispose of their goods. Proper hospitals should be provided. Wagons should be furnished for transport. Shipping and boats captured in the harbor will be turned over to American naval officers. No article is to be infringed on based on reprisals. For more details on the articles click here. Gunpowder changed the way that lives were lived and wars were fought, no one can deny that. From guns to bombs, to fireworks, to any number of uses. It gives a great amount of bang for the buck (pun intended). The only problem is that once it gets wet, it quits banging. So for ages people have been coming up with ways to keep their powder dry. The most popular was the good old-fashioned cow horn. It was waterproof and easily obtainable, just eat a cow and usually you get two! During the French & Indian War, American and British forces took the old-fashioned powder horn to new heights by engraving them with military themes. The smooth surfaces were perfect for engraving and anyone that has been to war knows the old adage, “hurry up and wait.” So the men had plenty of time to be creative. In the center of the horn is a distinctively carved tree. This style of the tree was like a signature for the artist. Unfortunately, he remains unidentified, but his work has been seen several times. On June 22, 1775, the Continental Congress issued the first Continental currency in the form of $2 million in bills of credit. At the time paper money was almost a rarity as most people preferred hard currency. Actual coins made of silver and gold. Unfortunately, there was not enough of the hard specie, as it was called, in the colonies to pay for the war. The paper money was backed only by the promise of future tax revenues and fluctuated badly from the start. The value rising and falling based on the performance of the Continental Army against the British. It did not take long for the up and down to become simply a down as rampant inflation, lack of faith in the currency and the British penchant for counterfeiting (Read more about that here! Or in the hardcover annual here.) made the paper not even worth the paper it was printed on. By 1781 the exchange rate was $225 to $1. ($225 in Continental currency for $1 of hard specie.) This was at a time when the average Continental Army private made $5 a month in Continental scrip. If they were paid at all. Most men had received little if any pay since 1778. Twelve hundred dollars for a quart of rum, and we thought prices were high today. The struggle to pay for the war is an epic tale for another time. It almost came to pass that counting on currency was almost a disaster. The map above is an original showing the siege action that took place at Louisbourg during the French & Indian War. Louisbourg is located on Ile Royal, the modern-day Cape Breton Island in Canada. The fortress was the key to St. Lawrence waterway and the interior of Canada. As long as the French held out, any British campaigns in Canada would be very difficult. In 1758 it took the British six weeks to take the fort and opened up Quebec to attack the next spring. That is not the story for today though. The real story is that years earlier in 1745 the fort had already been taken from the French. Not by the British Army however, but by brave men from New England (with a little help from the Navy.) This was one of the first military wins against a foreign power in the annals of American military history. In 1744 the War of the Austrian Succession broke out in Europe with the main combatants being England and France. It did not take long for the conflict to spill into the North American colonies. As was the case in the next war the French fortress at Louisbourg stood in the way of the British war effort. Talk of trying to take the fortress in the colonies made the rounds, but the British were not all that enthused about the idea. In the end it was decided that it would just be too darn expensive to launch an operation. Massachusetts Governor William Shirley would not take no for an answer. He thought that the fortress could be taken with just a few men and made a proposal to the General Assembly, which pretty much denied it deferring to their British overlords. Shirley would not be denied however. In all he arranged for 3,000 volunteers for land duty and another 1,000 for the naval duty. with backup coming from a British fleet in Jamaica. In a campaign that lasted a little more than a month the Colonists were victorious and Louisbourg was theirs! When news of the victory reached the colonies there was elation. Spontaneous celebrations of the “Citizen Soldier” ran rampant. Fireworks and liquor were widespread. This was the birth of the idea that the common man, the militia, were just as powerful as the “regular” army. It was this victory that sat in the minds of the next generation of Americans when war began brewing against the British. Speaking fo the British. The victory was not quite received as well. The common man on the street thought the victory was incredible. The Government though, were not as thrilled. Unknown to the colonists a peace treaty was in the works and the victory caused issues. In a move that would later come back to haunt them the British handed the fort back over to the French. When news of the return of the fort reached America the colonists felt betrayed. They had fought hard and well and won a great victory over the mighty French. Only to see their victory wiped out. This was a slight that would stick in the colonists craw for many years and would even be brought up during the march to revolution. So in many ways, the First Siege of Louisbourg had much more of an impact than the second. That above in the photo is a gorget. It is worn over the neck like a necklace. In the 18th century, it was a military symbol of rank worn by commissioned officers. Gorgets (from the French gorge meaning throat) started off in the Middle Ages as a woman’s fashion piece, usually linen, that wrapped around their neck or was part of a hood. It eventually became a leather or steel collar worn by men to serve as protection for the throat, eventually growing into a full piece of armor itself that would cover the upper portion of the chest as well as the throat. Gunpowder eventually entered the battlefield and made most armor obsolete. The gorget became more of a decoration for an officer. In this form, it was much smaller than its medieval counterpart. Usually, it hung on a chain or ribbon around the throat. Made with either gold or silver gilt, they served as a badge of rank. Also as an indication that the officer was “on duty”. In the 18th and 19th century most European armies made use of gorgets. The decorations of the gorgets varied based on the armies. For the British, they were decorated with the royal coat of arms until 1796. The Swedes contained the king’s monogram. Junior officers usually just had them inscribed with their initials. British officers wore then until 1830, the French until about 1830. Prussia/Germany kept them until 1914 and brought them back under the Third Reich. the Swedes kept them until 1792 and then replaced them with epaulets. However… they are making a comeback in their original armor form in the US Military as part of the new generation tactical vests. So that gorget above, kind of pretty all gold and such. That one once belonged to George Washington and was from his days a Virginia Militia officer. The decoration on the piece is the symbol of his Virginia regiment. In fact, it is most likely the very one that he is wearing in this famous painting of the great man. 1772 portrait of Colonel George Washington by Charles Willson Peale. In 1753 the Governor of Virginia, Robert Dinwiddie, sent Major George Washington (then only 21) into the Western reaches of the Colony to warn the encroaching French that they were trespassing on land that was claimed by Virginia for England. The land in question would eventually become Ohio. Washington and his small expedition was to deliver an ultimatum to the french garrison at Fort Le Boeuf not far from Lake Erie. He was received by the French commander who told Washington that he would forward the request to his superiors in Quebec, but in the meantime they were going nowhere. When the expedition kicked off Washington was sure to take experienced woodsmen, explorers and interpreters with him as he was about to get his first taste of the true frontier. On his tour he dealt with rain and snow, visited a number of French forts and even some native villages. Putting his skills a s a surveyor to the test he even created one of the first maps of the Ohio River Valley that would prove useful later. Realizing that he was not going to get the answer he was looking for Washington headed home. As soon as he returned to Williamsburg Washington wrote out the official report of his trip and handed it over to Governor Dinwiddie who immediately saw it as a tool to warn people about the encroaching French menace. Dinwiddie had the journal published in book form and in broadsides and excerpts even showed up in newspapers in the colonies and back in England. Over night Major George Washington became a name well-known at home and and in the social circles in London. The picture above is of one of the original copies of the published journal. Side note. Dinwiddie would send Washington back to the Ohio River Valley on a second expedition to parley with the French. This one did not go as well and George Washington may well have accidentally started a world war that would end with the French leaving the New World and the British American colonies on a slippery slope to revolution. Too bad he didn’t keep a journal of THAT adventure! So, you think that Congress is slow to act now? The medal above was commissioned by Congress in 1776 to honor General George Washington for his role in forcing the British to abandon the besieged city of Boston. A gold one was to be struck and given t General Washington, silver ones would be struck and given to dignitaries and VIPs. The front of the coin, which should look a little familiar is based on the bust of Washington Jean-Antoine Houdon, the back side showed a scene of Washington and four of his men on Dorchester Heights overlooking Boston. Over the net twelve years Congress would authorize six additional medals. In 1777 they honored General Hortaio Gates and 1779 General Anthony Wayne. Major Henry Lee, General’s Morgan and Greene would follow over the next couple of years and the last of the era went to John Paul Jones for his capture of the Serapis. So about the delay. Congress approved each of these medals in quick form, but it turned out that there was no where in the colonies that could actually produce the medals, so they looked to France to produce the awards. And they took their time. On March 21, 1790 President Thomas Jefferson presented former President Washington with his medal, as well as a box containing the other five medals commissioned fourteen years after they were ordered. If only they had Amazon! Over the years the Congressional gold medals would be given to prominent military men, but later recipients would expand to include actors, artists, musicians and other entertainers.